Add Tech Home Protect NOW and get 3 months of service FREE! GRM Networks has partnered with SecurityCoverage to offer a complete solution for your computer security, maintenance and support needs. Tech Home makes technology easy. Secure your desktop, laptop, tablet and smartphone to guard against viruses, hacking or stolen and lost items. Learn more about the available Tech Home packages below. For the months of April, May and June 2019, add Tech Home Protect to your services and receive the first three months of service free. 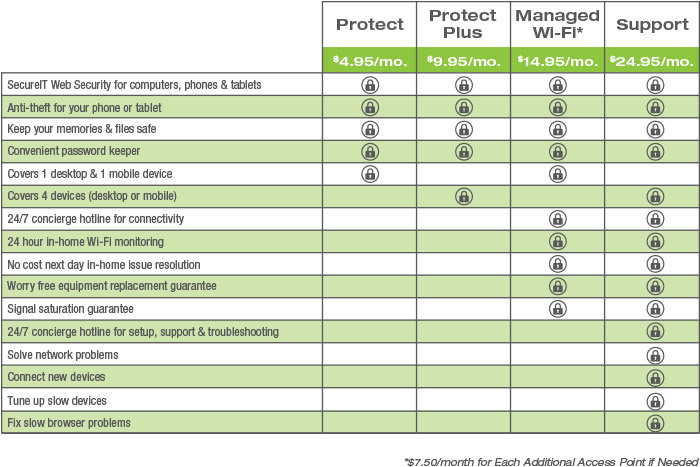 Add Protect Plus, Managed Wi-Fi or Support packages and receive one month of service free. If customers do not keep the service for six months after the promotion time frame, customer will be billed for the amount of the promotion credit that was given. Tech Home also offers Quick Fix solutions to help you with one-time restoration, cleanup or fixes on your devices. For more information on these products, call SecurityCoverage’s 24/7/365 support at 1-877-373-3320.